OOTS! Lunchbox Deluxe is the perfectly stacked lunchbox, designed to be fun, playful, and easy for kids to manage. These slick, contemporary lunchboxes come in eye-popping blue, green and orange color combos. The deluxe version comes with everything you need to pack a healthy lunch — four small containers and one large container fit neatly inside the colorful box — which means food stays put and stays fresh. All materials used to make the OOTS! Lunchbox are BPA-free and phthalate-free, and components are dishwasher safe. The handy carrying strap may also be used to hold a water bottle. OOTS! Lunchboxes are the optimal combination of style and functionality for organized lunchtime bliss. OOTS! Lunchbox Deluxe is the perfectly stacked lunchbox, designed to be fun, playful, and easy for kids to manage. These slick, contemporary lunchboxes come in eye-popping blue, green and orange color combos. The deluxe version comes with everything you need to pack a healthy lunch -- four small containers and one large container fit neatly inside the colorful box -- which means food stays put and stays fresh. All materials used to make the OOTS! 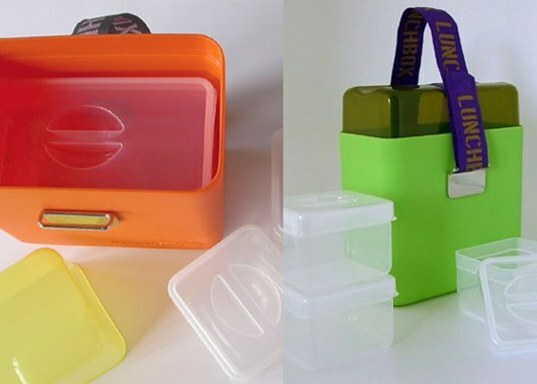 Lunchbox are BPA-free and phthalate-free, and components are dishwasher safe. The handy carrying strap may also be used to hold a water bottle. OOTS! Lunchboxes are the optimal combination of style and functionality for organized lunchtime bliss.